Once the overshadowed sibling of spectacular Surfers Paradise, Broadbeach has blossomed into a hub of Gold Coast culture with a generous sprinkling of amazing restaurants and shopping and the trademark golden sand beaches with thundering sapphire surf. ‘Broadie’ to the locals, is well-known for excellent shopping, myriad of restaurants, and a classy culture but there is more than meets the eye with this multifaceted area. Broadbeach is framed by beautiful green foreshore picnic and barbeque areas, a perfect escape from the sun when spending a day on the beach. There is also a large park where you will find kids laughing and playing on the extensive and creative playgrounds, people reading in the shade or enjoying a snack on a picnic blanket, and cyclists sharing the walkway with mothers and their strollers. Part of what gives Broadbeach its sophisticated charm is the way the architecture highlights and compliments the areas natural beauty rather than attempting to outshine it. If you are without a car during your trip to Broadbeach, do not fear, Broadie is well connected with the rest of the Gold Coast by the light rail stopping in two locations throughout Broadbeach and heading as far north as the Gold Coast Hospital. There are also a host of taxis available for more direct trips. And trust us, with so much to explore, eat, shop and experience you will be out and about in your time at Broadbeach. If your trip to Broadbeach coincides with either the first or third Sunday of the month, you have hit the shopping jackpot. The Broadbeach Art and Craft Markets boast locally made crafts, fresh produce, and trinkets galore spread across more than 150 stalls. Everyday shopping is available simply by strolling down Broadbeach mall where the strip is adorned with boutique shops filled with couture, beach themed homewares, and a generous dash of local art. Also located on Broadbeach Mall is the Oasis Shopping Centre, the premier destination for cosmopolitan retail therapy. With over 100 specialty stores, the mall is teeming with diversity from fashion alcoves to yoga studios and gyms to chemists and major supermarkets. It is also within walking distance of most Broadbeach accommodation, and therefore is perfect for last minute purchases such as selecting a necklace or belt to pull your outfit together before dinner! For the ultimate in Gold Coast shopping, and one of the largest shopping centres in Australia, turn onto the bridge crossing into the fairy tale castle that appears to float atop an island and you have arrived at Pacific Fair. Home to hundreds of specialty stores and several majors including the Gold Coast’s largest Myer, Pacific Fair is a unique experience with an indoor/outdoor setting incorporating several varieties of dining as well as Broadbeach’s local cinema. Turn even the most decisive person into a blubbering mess with the plethora of delectable restaurants peppering the streets of Broadbeach. Hank Dining and Bar is voted #1 on Trip Advisor for Broadbeach restaurants and there is little wonder why with their extensive share plate menu offering tapas with a twist, a selection of unusual, yet delightful wine, and friendly staff. Sage Restaurant has been dubbed the Best Family Restaurant, 2014 by ‘I Love Food Awards’ and boasts a hearty menu with family friendly ambience. For a gluten-free friendly menu in a romantic setting, Verve Restaurant Café & bar offer an amazing menu at reasonable prices. While Rocksalt Modern Dining offers contemporary and upmarket presentation with a relaxed atmosphere and cuisine focused on locally caught seafood. For those with time the five or eight course degustation menu is thoroughly popular and highly recommended. A local gem, The Kurrawa Surf Club is uniquely located in the heart of Broadbeach on absolute waterfront of one of the most spectacular beaches in the world, setting it apart from the crowd. In the right season a decadent lunch or dinner at the surf club can often come with a side of whale watching! A newly renovating Cardamom Pod is an absolute delight with views across the gorgeous park, mouth-watering vegetarian and vegan cuisine, and a selection of to-die-for desserts, ‘The Pod’ has earned its spot at #7 on Trip Advisor. The restaurant is uniquely popular among those looking for cruelty free options as well as people simply looking for brilliantly fresh and tasty cuisine. Amongst these restaurants there are a host of alfresco options and cafés as well as convenient take away nooks that could put 5 star establishments to shame. No matter where your Broadbeach accommodation is located, you could drown in foodie heaven. The Gold Coast Convention and Exhibition Centre located centrally is either a tram stop or short walk away from all things Broadbeach. It is also the premier centre for all concerts, theatre performances, trade shows, sporting events, conferences and conventions to hit the Gold Coast, everything from Cirque Du Soleil to Supa Nova is hosted here. Just next door, Jupiters Casino is also host to an array of more intimate shows often paired with dinner and a nice glass of wine. Stretching over 80 kilometres, the Gold Coast coastline offers pristine golden sand beaches, clear blue waters, crashing waves perfect for surfing, and the famous Aussie lifeguards in red and yellow patrolling the water. Visitors travel across the globe to enjoy this experience and they are not disappointed. Broadbeach is one of the more popular areas of the Gold Coast, with Kurrawa Beach known as one of the safest beaches hosting many surf lifesaving events. The expansive beaches leave plenty of room for people to soak up the sun and relax, throw a volley ball around, play a game of beach cricket, or indulge in one of the coast’s most popular activities – surfing. On the Gold Coast fun comes naturally with Australia’s most popular assortment of family-friendly theme parks. Australia’s largest theme park Dreamworld is overflowing with rides and attractions to suit toddlers through to adults, attached at the hip is Whitewater World – a mecca of water fun. 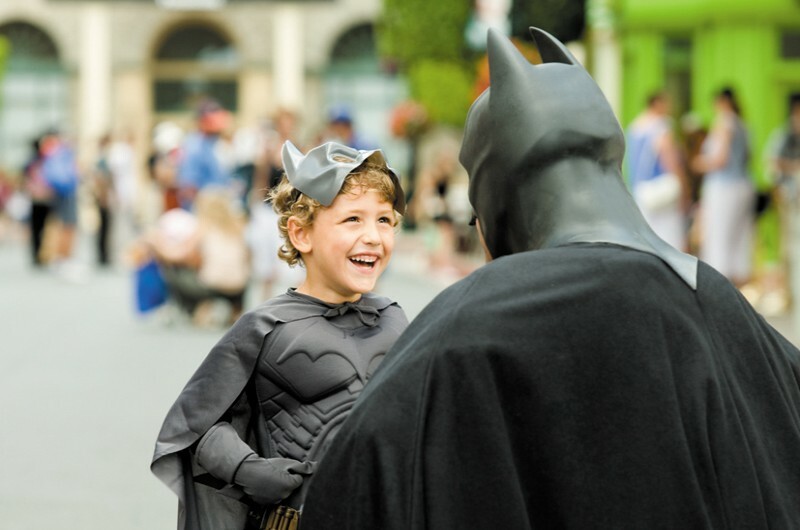 Movie World somehow manages to contain its superheroes who roam the grounds mingled with the guests enjoying the fantasy realm complete with adventure rides and movie attractions. While the original water park Wet ‘n’ Wild offers a day of water adventure and fun. These theme parks are a short drive from Broadbeach, and transfers are easily organised through accommodation providers. Due to Sea World Resort’s need for proximity to the ocean, it is closer to Broadbeach than the other theme parks and bestows upon guests an intimate animal experience no other resort can offer, along with water and adventure ride fun. Gold Coast theme parks are inherent in the culture and no trip to Broadbeach would be complete without a visit to Australia’s best theme parks. For your hit of flashing lights and razzle dazzle take a trip to Jupiters Casino, where you can put everything on black, enjoy a pina colada, enjoy a swanky dinner, and dance the night away. This vibrant hub of glamour and style offers over 70 game tables and 1 300 gaming machines all on a single level 24 hours a day. Queensland’s first casino also offers intimate shows with dinner and promises an entertaining night out. Broadbeach has graduated into an established Gold Coast icon, known as a stylish destination dotted with restaurants, beaches, and shopping that has somehow held onto its relaxed atmosphere. No matter how in demand Broadbeach becomes, it will always be known fondly as ‘Broadie’.